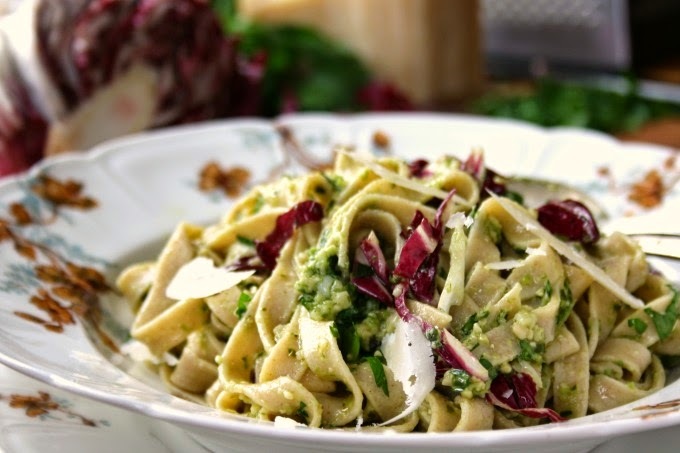 Making homemade pasta is easier than you think & delicious results make it worth the effort. Simple four-ingredient homemade pasta makes for much family fun in the kitchen. The Christmas of 1984 mom received a pasta maker as a gift from my brother and sister. They were both living in Toronto at the time so pasta makers were easy to come by. The idea of homemade pasta seemed very exotic and pasta making became a family adventure. We’d all get in on the fun and by the time we were finished the pasta was hanging all over the kitchen drying. It was draped over the backs of chairs, on the handle of the wood stove and the oven. Homemade pasta is especially fun to make with kids since everyone can get in on the action. The person manning the roller can keep rolling while those who catch the cut pasta can go running off in search of some place to drape it. You can always curl the cut pasta into little nests instead but draping it around the kitchen makes you feel like you have accomplished a lot. After all of that cutting, rolling and draping you’ll think that you don’t have much to show for it, but be careful. A serving of homemade pasta need not be large to be satisfying. This recipe makes enough pasta for four to six people. Pasta can be rolled and cut by hand too so no worries if you don’t have a pasta maker. Homemade pasta is so delicious on its own, and has such a wonderful texture, that you don't want to drown it in heavy sauce. 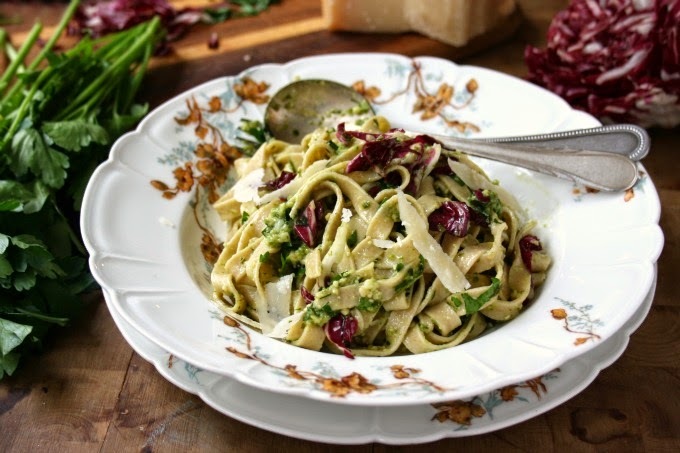 I love it best tossed with a bit of pesto, some slivered radicchio, pine nuts, parmesan and a squeeze of lemon. This recipe is great for cut pasta and for homemade ravioli as well. Blend flour, eggs and olive oil in a food processor until well combined then add the 2 Tbsp. of water and blend until the dough begins to come together in a ball. Add a drop of water (literally, just a drop) if the dough seems too dry. Blend for 15 seconds then place on a saucer and cover with a bowl. Let dough sit at room temperature for 30 minutes to an hour. Cut dough into three pieces and working with one piece at a time (leave the others under the bowl) roll and cut the dough using a pasta machine. If you don’t have a pasta machine roll pasta by hand, using as little flour as possible (ideally no flour). Cut into strips using a pizza cutter. Bring a big pot of water to the boil and cook the pasta for 3-5 minutes. Time will depend on how thinly you roll your pasta. Green tip: I make my pasta with organic stone ground whole white flour (contains 85% of the wheat kernel) and it works perfectly. I have also made this recipe with semolina flour.